Today was ABCâ€™s day to share their fall schedule (LW). With TiVo, I have to take a minute to think about what I actually watch on a channel. For ABC I think itâ€™s only Modern Family and The Goldbergs (please watch The Goldbergs). A slight adjustment puts those two shows back-to-back. But is there anything new? SelfieÂ jumped to my attention first thanks to Karen Gillan (Amy from Doctor Who) and that it is somewhat based on Pygmalion (the characterâ€™s name is Eliza Dooley). I wasnâ€™t blown away by the trailer but those points earn it a chance. Other than Selfie, Iâ€™m not seeing much. I havenâ€™t listened to much Nerdist recently, but itâ€™s one of the many podcasts that I keep around just to see the guests before deleting. When I saw this episode with Jessica St. Clair and Lennon ParhamÂ (LW) pop up, that was a guarantee listen. I mentioned them and their show Playing House a few days ago. The town on the show gave me a Gilmore Girls vibe and has that potential so when Jessica compares it to that during the show, I was very happy to be proven correct. Iâ€™ve only just started on Fridayâ€™s No Such Thing As A Fish, but their first fact is shareable. It was about a jockey that died during a race, but didnâ€™t fall off the horse, and finished in first. To add to that, the horseâ€™s name was Sweet Kiss, gaining it the nickname Sweet Kiss of Death. I didnâ€™t find a ton of information, but OMG Facts had a quick postÂ (LW). Letâ€™s see how posts work taking some of the highlights from my WinkStream on LinkyWink over the past day or so. TEDTalk from Randall Munroe who writes What-If on xkcd. If you follow What-If, or follow me as I Wink about half of them, then youâ€™re already all in on this talk. Upfronts are apparently coming up soon. Usually that means lots of cancellation news, but it seems that most of my favorites fate has already been decided. Only Community is still up in the air. This year all the news seems to be around pilots. Difficult People on USAÂ (LW) created by Billy Eichner and Julie Klausner. Most of the news stories focus on Amy Poehler producing, and sheâ€™s great, but you have me sold on Eichner/Klausner. The show is about best friends who hate everyone except each other, so it sounds perfect. Itâ€™s on USA, which I hadnâ€™t watched in forever, I think they used to show American Gladiators in the mornings during the summer. Recently, they hooked me with Playing House, which is a slightly different show from Best Friends Forever, but mostly the same, as it should be because NBC should have never cancelled it. Rashida Jones had a pilot picked up on TBS (LW). Itâ€™s produced by Steve Carell and his wife and sounds a bit like Brooklyn Nine-Nine just because itâ€™s a cop comedy. Making fun of Law & Order, Rashida will work in the RHCU, Really Heinous Crimes Unit. Grantland had a good overview of pilots on all the networksÂ (LW). The only draft related link I have for you is from The Onion, where Mel Kiper has been trapped under his Big Board (LW). Last, for the Philly based fans. The Eagles arenâ€™t brining back Dan Baker (LW). You might not know the name but if you have been to a Phillies or Eagles game, then you know his voice. Always seemed to me like a while Phillies season was enough, so hopefully heâ€™ll enjoy a lot of free Sundays. 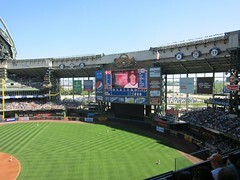 Wrapping up my recaps of my trip to Wisconsin with the main reason I went: Reds @ Brewers, Sunday, August 18th. I think this may have been my first tailgate for a non-Penn State game, certainly my first baseball tailgate. Brewers tailgating seemed different than what I saw at a Phillies game a few years ago. This is something they’ve always done, not just when they got good, because, well, the Brewers haven’t had much of a run. For the tailgate, we had some brats along with the previously mentioned Bavarian mustard. The nice family next to us even came over to chat. They were very Wisconsin (the accent) and I guess noticed that we weren’t very Wisconsin. When it came time to go in, I had only half finished my Gatorade, we also had some brats left. My friend said to just take it in. What? My bottle was already open, and it’s not water. Sealed bottles are the only type of beverage I’ve heard are sometimes allowed in stadiums. I was assured it would be no problem. And it wasn’t. Nobody questioned me on my way in. 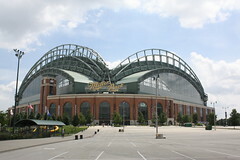 I had posted previously that during August home games, the Brewers were giving $10 vouchers to everyone and they could be used on food or merchandise. With the tickets being $15 on StubHub, that is altogether a pretty good deal. The first reaction, even from the outside is how large it is with that retractable roof. Inside, you get the feeling that they didn’t go cheap on putting this thing together. I believe the only other retractable roof stadium I’ve been to is in Seattle, where they spent a fortune since they had to secure it against earthquakes. Everything else is standard fare for the new stadiums. The seats are all great and there is plenty of space to walk around on the concourses. Another thought, and this applies to many newer stadiums, is the open views in the outfield when there isn’t much to be seen. 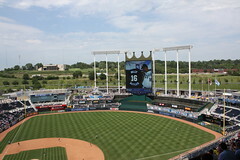 The other similar one is Kansas City. I guess having seats out there doesn’t make a lot of sense, smaller cities have trouble filling what they have. Still, I like the upper levels to connect via walkway. 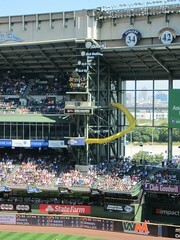 Bernie’s Slide – I did get to see a Brewers home run and I did get to see Bernie go down the slide. Hats off to Bernie. He’s always standing out there, ready to go as soon as a ball clears the fence. 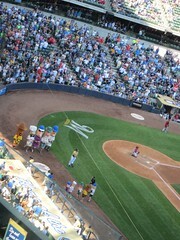 Sausage Race – It was a relay the day I was there. Kids as mini-sausages were ready for the hand-off. I think the excitement level would have been amped up if I had a favorite in the race. Here’s where it all fell apart. My friend already has a Brewers Ice Cream Helmet. So I didn’t consider it being a problem. In line, I didn’t see any helmets. Then I started seeing people getting ice cream in dishes. I saw someone at a closed register and went up to ask. He was very knowledgeable and said that they don’t have them any more. My only option was a huge helmet filled with nachos. Don’t have them any more? Were people not happy with them? Did they cost too much? This should be a ballpark staple. If you are cutting costs that much, just keep some around and charge an extra dollar. I went around the whole stadium to see if maybe there was a stand left. I came across one stand that was ice cream only, but they didn’t have them. I was tricked by old Dippin’ Dots stands that are now used to sell popcorn or nuts. So much for the future, eh, Dippin’ Dots? The current list of helmet fails: San Francisco, Oakland, LA (although that may have been a ticket issue), and now Milwaukee. Can I call a meeting of stadium owners so they can start to make an effort on lines at these stadiums? The only excuse to not have enough concession lines that it never gets more than two or three people deep, is a lack of space. 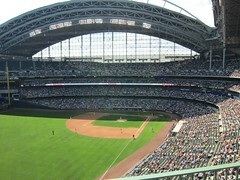 Miller Park is not suffering from this issue. More lines means more revenue. The markup on these concessions makes the expense of paying someone next to nothing. There has to be solution. I’d like to see more attempts at trying different approaches. One item per stand? Try it. Separate lines for cash or exact change? Pre-purchase vouchers for items, or have machines to buy the vouchers so credit cards don’t take too much time? Just try something. Overall, I liked the stadium. I’m not sure there is a bad stadium left in the majors. The Twins and Mets have newer stadiums (I didn’t like the old ones) and I didn’t mind Tampa Bay. It is hard to differentiate yourself at this point. You can only do so much with the in-game experience if your team has been out of the playoff race most of the season. Back from my weekend trip to Wisconsin. I probably don’t need to explain the purpose of the trip because when someone takes a trip in the summer, Wisconsin is usually at the top of the list. 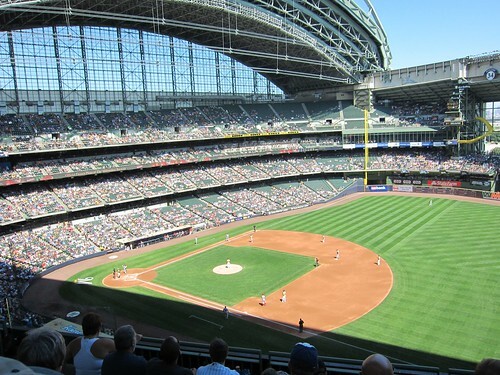 I went because my friend is in a Phd program at UW – Madison and I haven’t seen a Brewers game at Miller Park yet (I was at the stadium a few years ago, but the Brewers were on the road). I’ll try and share some posts over the next few days to recap the trip. I’ve been trying to utilize Spotify to listen to more comedy albums. I’ve queued up some new ones and some classics. Myq Kaplan obviously falls into the newer category, and this album was released this year. I’m not going to be sharing every one I listen to. So the fact that it’s here means that I really enjoyed it. He has a lot of really smart humor (I’m a sucker for math jokes) and is quite skilled in the deadpan misdirection. My trip to Wisconsin in a few weeks just got $10 cheaper. The team says they were planning this before Ryan Braun’s suspension, but now it’s being tied to that not just because of timing but because the amount the team won’t have to pay Braun the rest of this season is very similar to how much this program will cost. It sounds like the vouchers can be used on just about anything in the stadium: food, beverages, tickets (where I assume you get another voucher), and merchandise. You can hang on to them and combine them, so that’s cool for season ticket holders who could save up a few hundred bucks during the month and go crazy at the team store. Me? I imagine my $10 will go toward a hot dog and ice cream helmet. Minor League Baseball is having a contest to determine the best ballpark food. To be socially relavant, they are calling it a #foodfight. It’s the sort of thing I have to warn you in advance that you will become hungry or drool on your keyboard. It’s broken down into four categories: Gut Busters, Hots N Dogs, Local Legends, and Scrumptious Sandwiches. Your natural instinct might be to stick with Gut Busters, but don’t sleep on the other categories. You might even find something local. I’ve been to the State College Spikes, but I had no idea they had a spam pizza (nominated in the Local Legends category). But really, must go to Rochester and haz cheeseburger plate. I’m very upset about the NHL lockout. With giving up college football and not really wanting to go all in on the NFL, the NHL was all set to get a lot more viewing from me this season. What we have here is a positive link for NHL fans. Center ice designs for all the NHL arenas. So you can see all of them on the homepage. So cool, right? Oh, it’s not done. Click around for historical center ice designs. Yes. Historical. One thing that stood out is that most teams have gone with the single giant logo these days. Only the Flyers and Canadians have the two logos on each side of the red line. Looking at all the Flyers designs they have on the site, the only reason they’ve ever really had to change is for the numerous changes to the name of the arena thanks to all the bank buyouts and mergers over the years. The Spectrum always had the best designs and that early 90s center ice should be the design for all time. I’m always interested in these, although I usually prefer to have some maps to get a real idea of what is going on. Green Bay has the least amount of travel ahead of them. A trip to Seattle and New York (Giants) are the only times they have to wander out of the central part of the country. Most northeast teams usually have the least amount of travel. The NFL is a little different as it isn’t weighted quite as heavily toward your division. And the division matchups could give you a few trips across the country. Also, having the Cowboys in the NFC East is wrong geographically, so that adds some travel. Looking at the Eagles, Phoenix is the biggest trip with New Orleans, Dallas, and Tampa Bay all in that mid-range giving them the 21st most miles traveled.